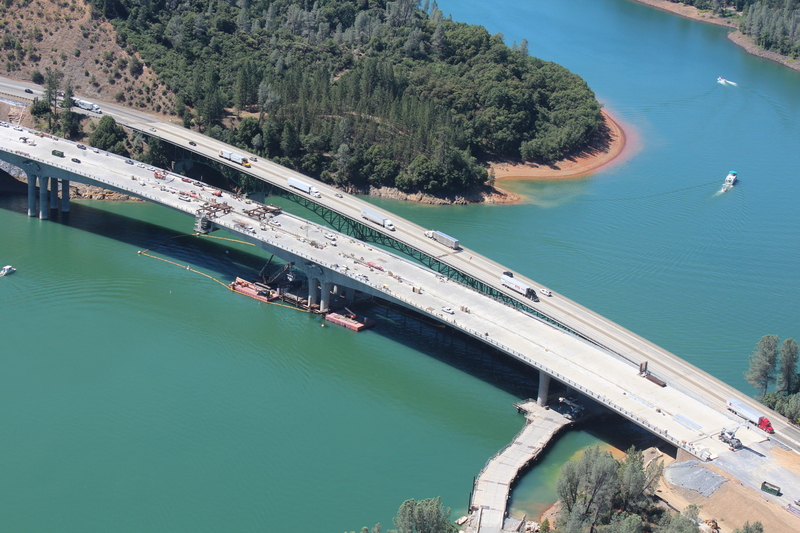 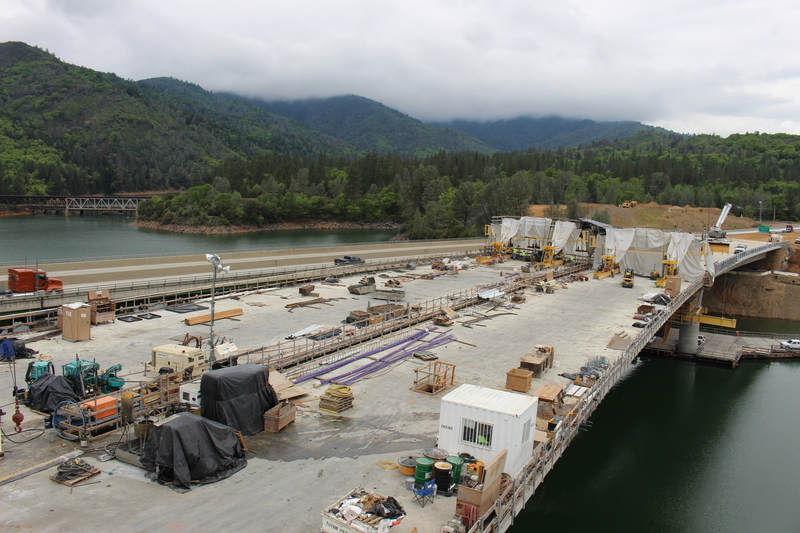 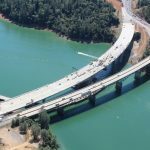 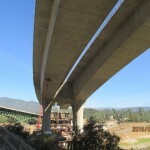 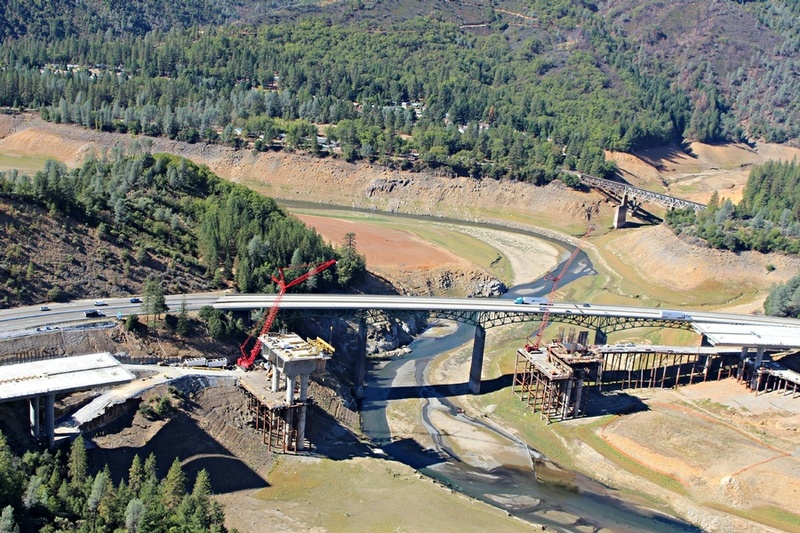 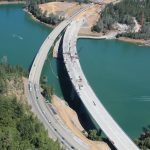 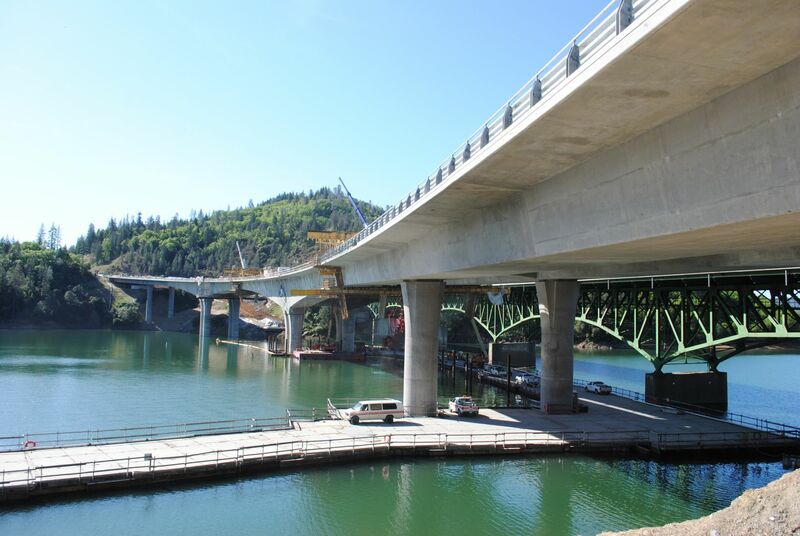 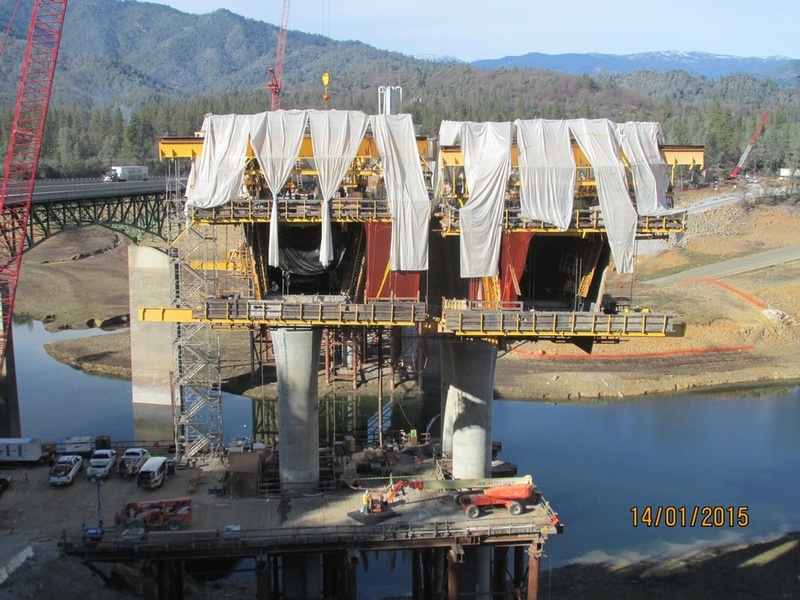 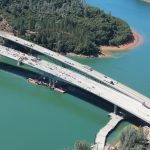 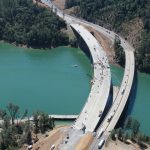 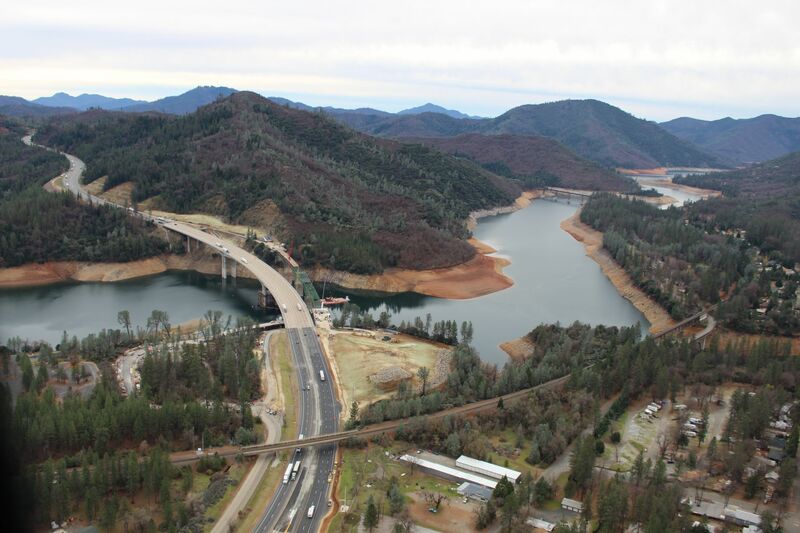 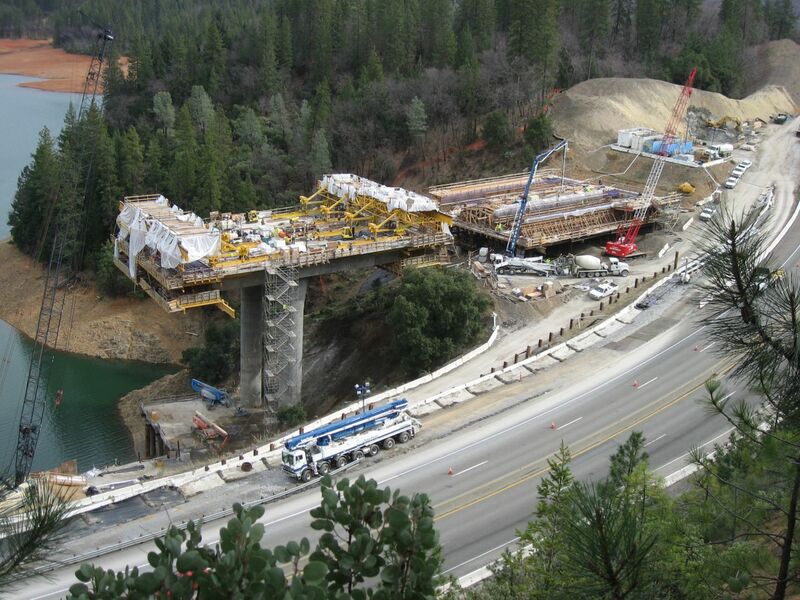 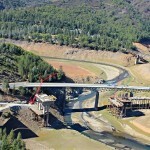 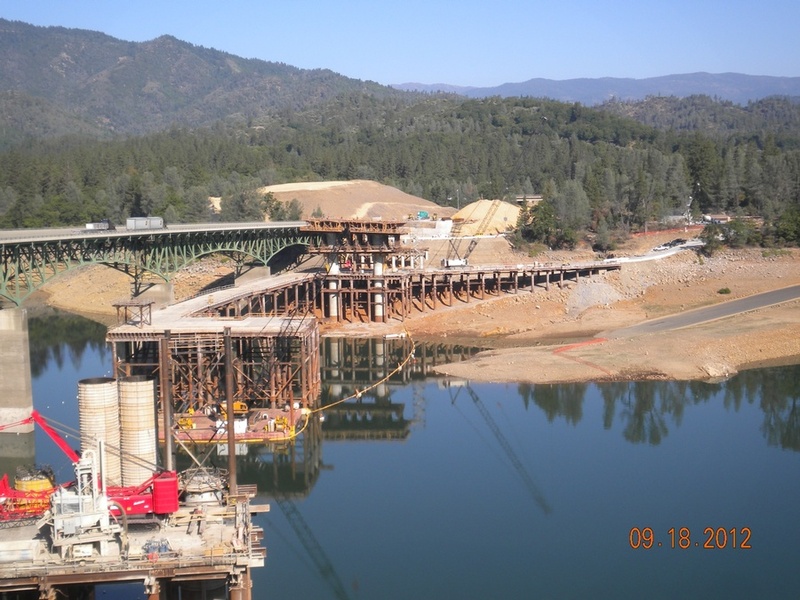 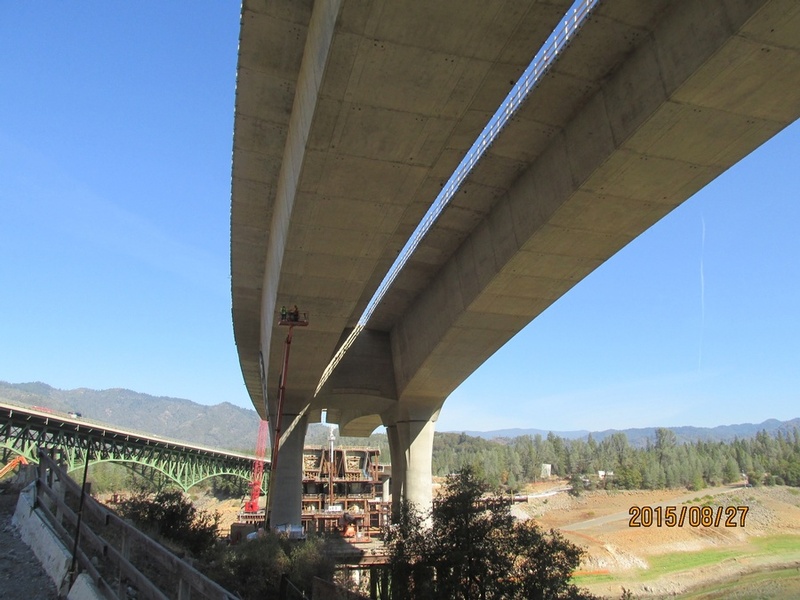 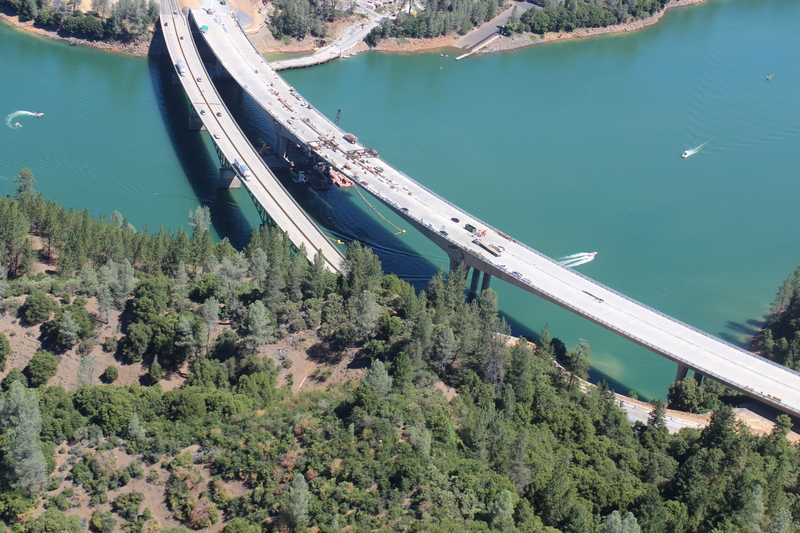 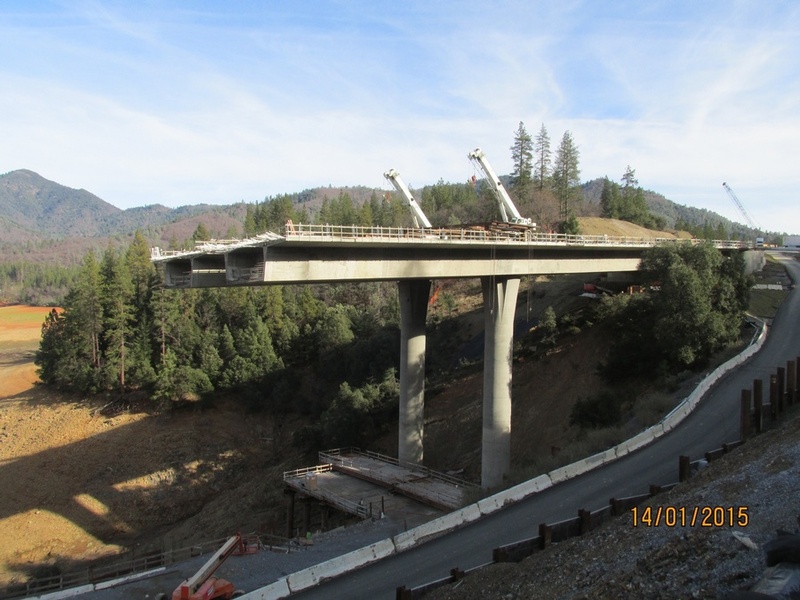 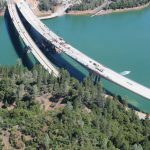 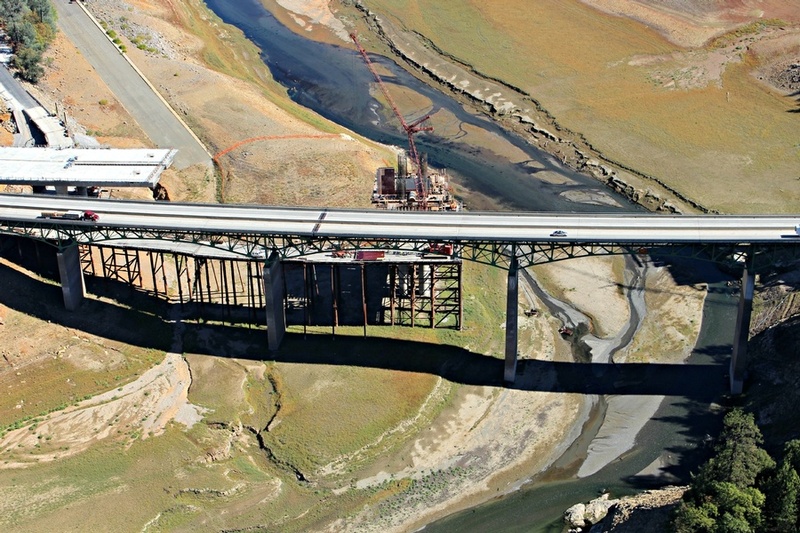 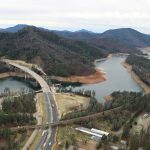 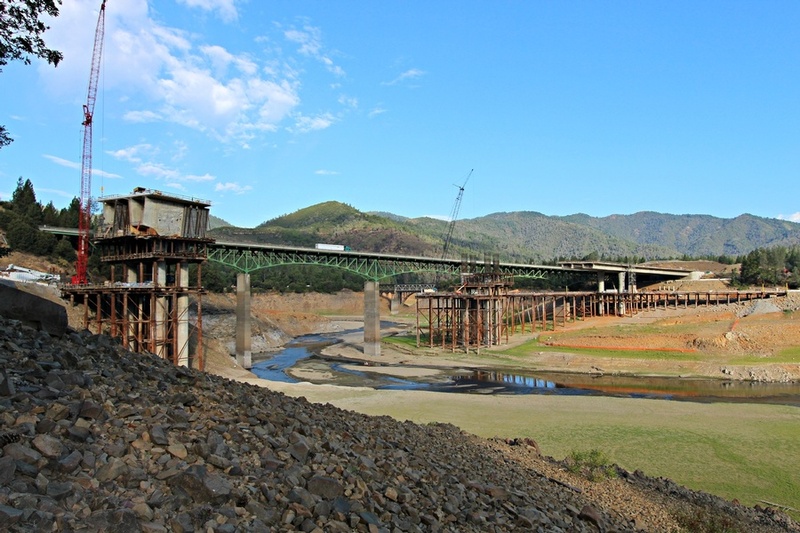 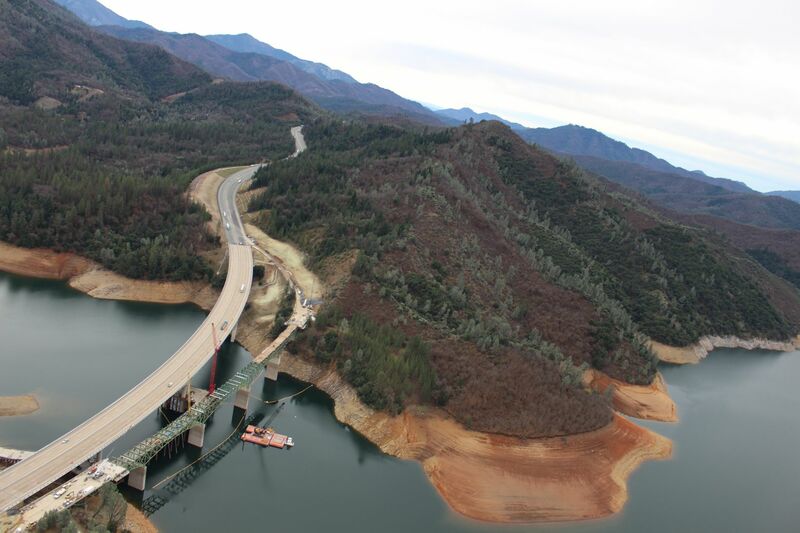 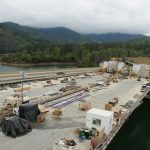 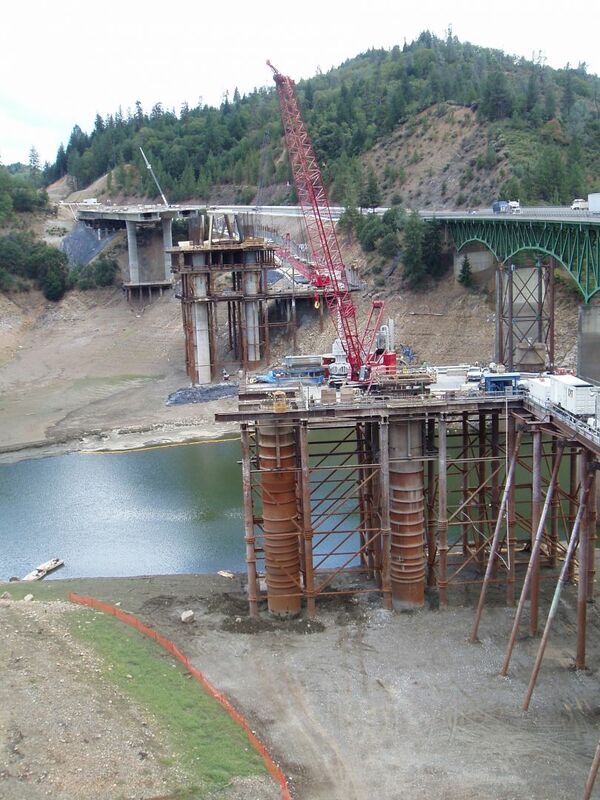 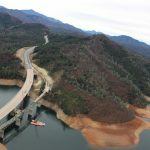 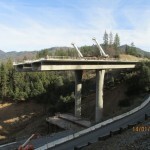 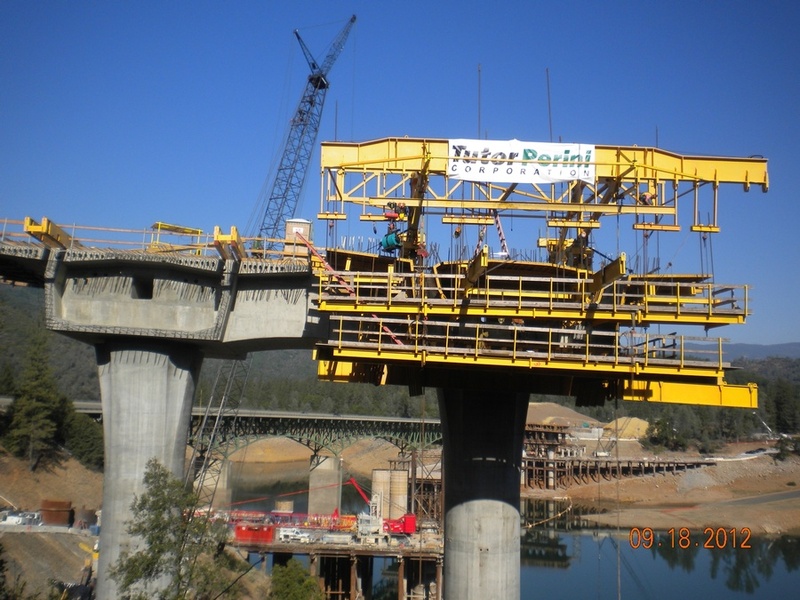 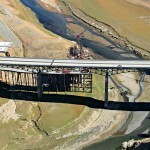 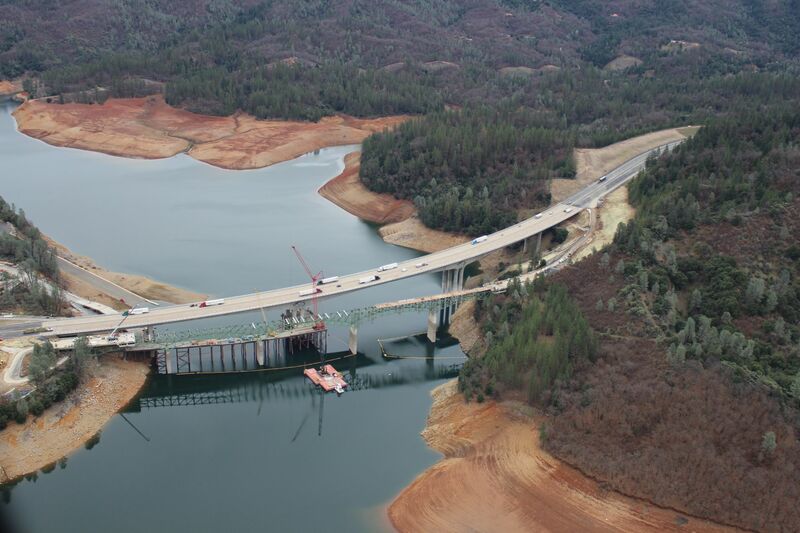 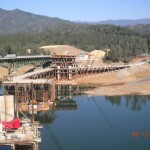 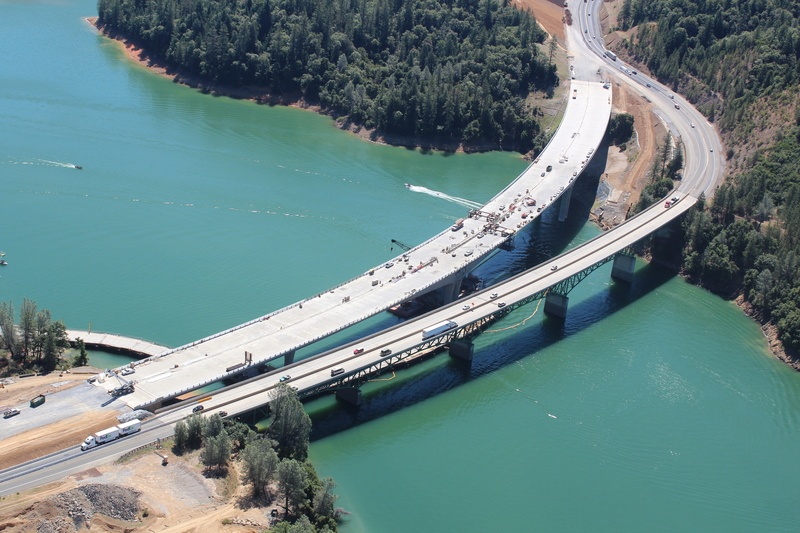 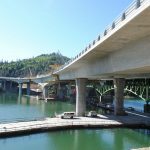 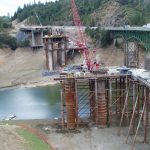 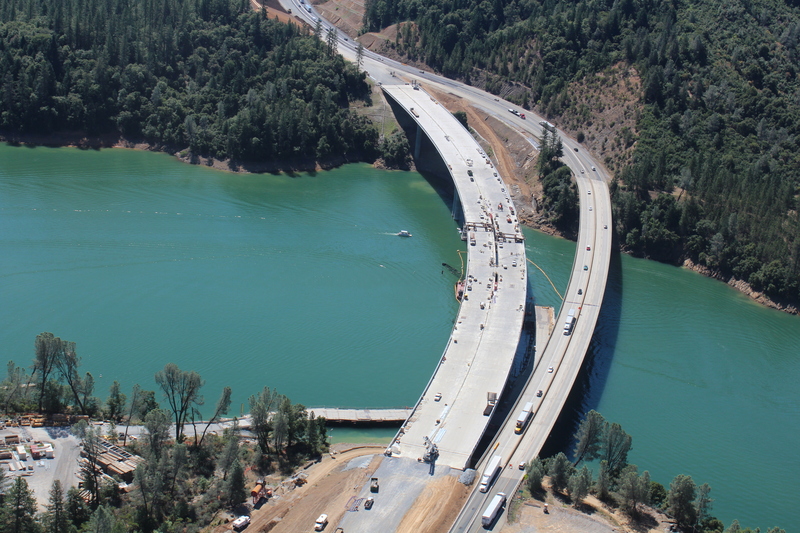 This $131M bridge was constructed on a new parallel alignment just east of the existing bridge, which spans the Sacramento River arm of Shasta Lake, California’s third largest lake and largest reservoir. 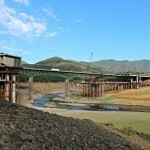 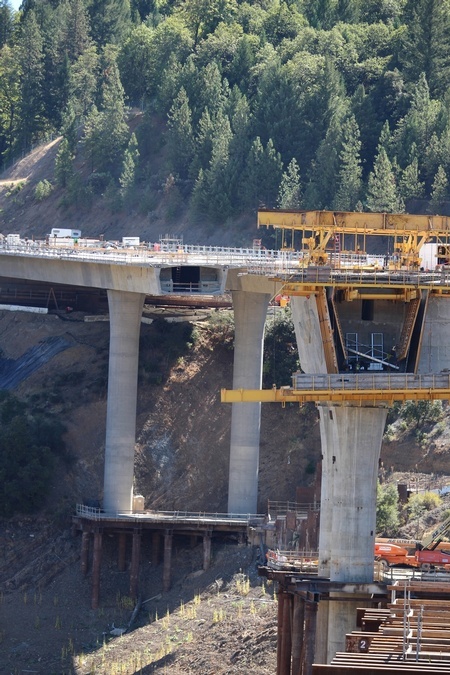 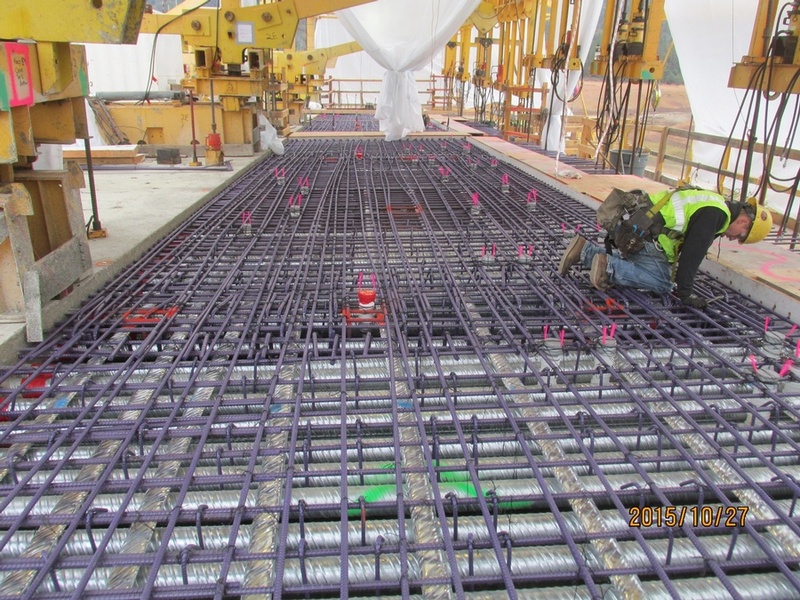 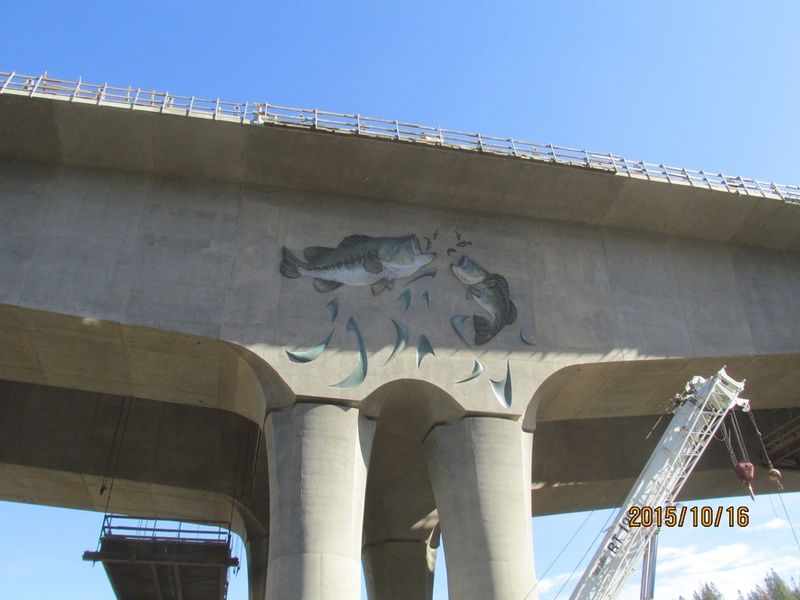 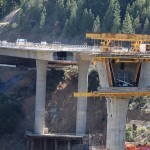 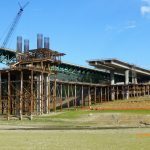 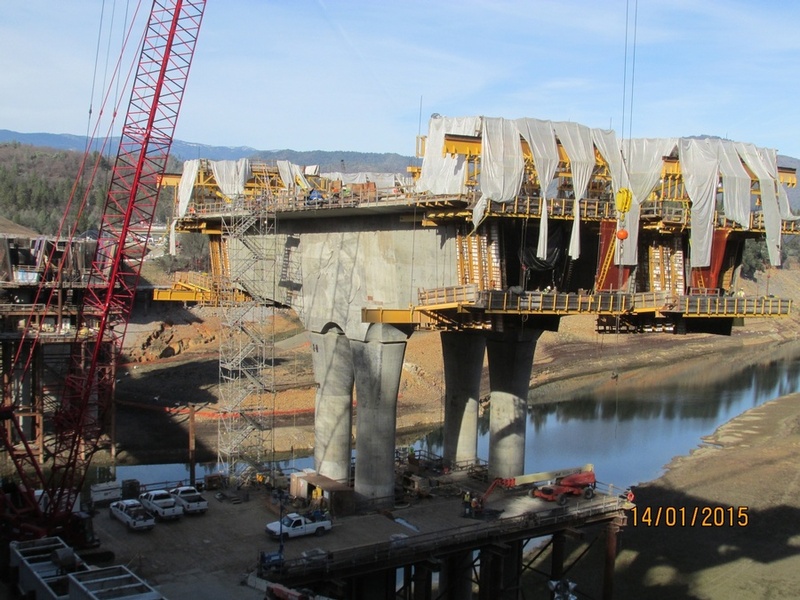 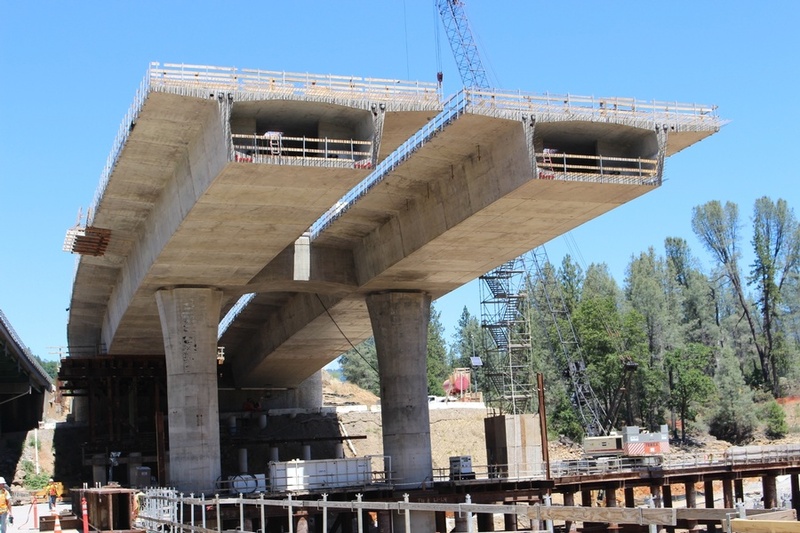 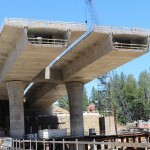 The new bridges are twin cast-in-place segmental box girder superstructures consisting of 5 spans, 1,942’ long and 104’ wide connected with diaphragms at the piers as well as a full length closure pour, connecting the wings. 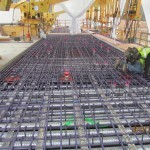 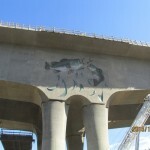 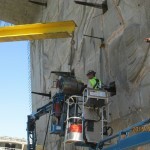 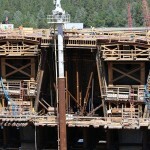 The superstructure depth varies from 29’-6” deep to 12’ deep. 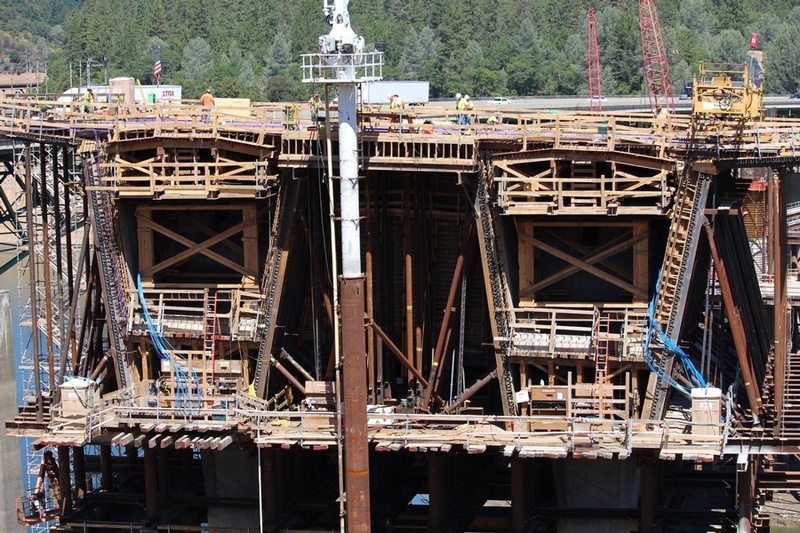 The structure, designed for a 100-year life, consists of 13 million pounds of steel and more than 36,000 cubic yards of concrete. 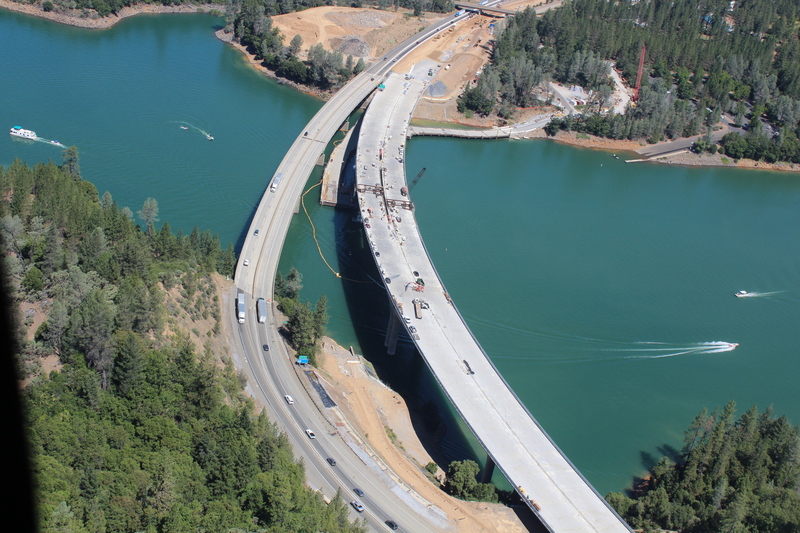 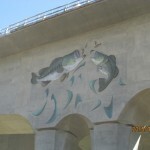 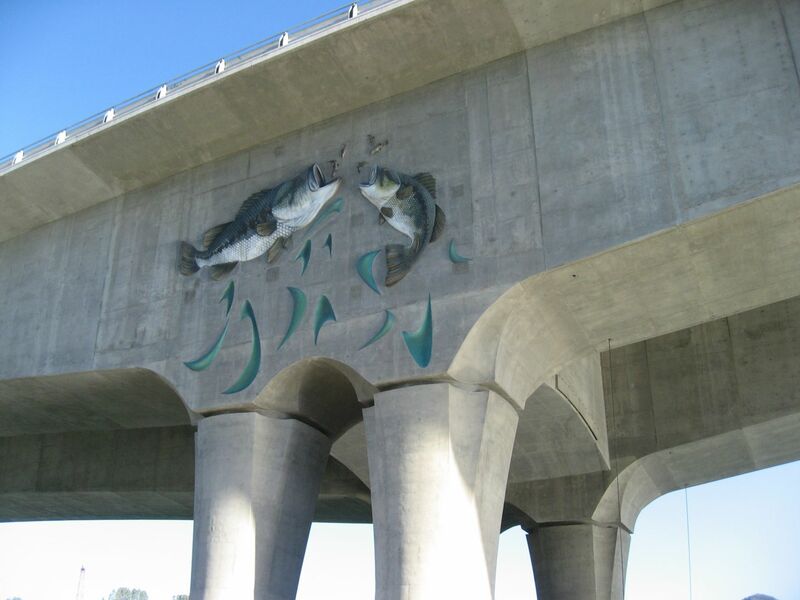 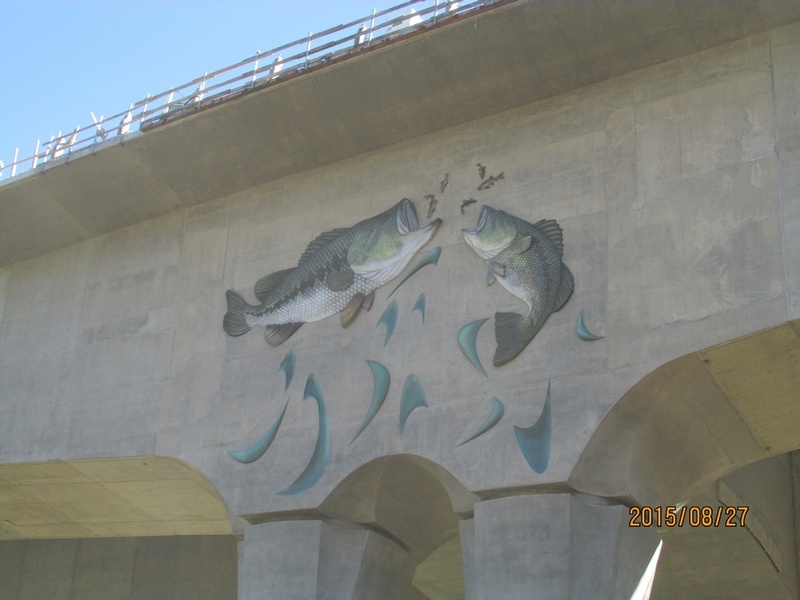 Located in the Shasta-Trinity National Forest, the bridge incorporates several aesthetic and environmental details. 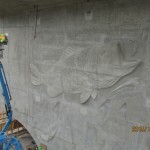 The structure includes 16 bat houses under the pier table diaphragms, along with two large-mouth bass motifs on the webs of the pier tables. 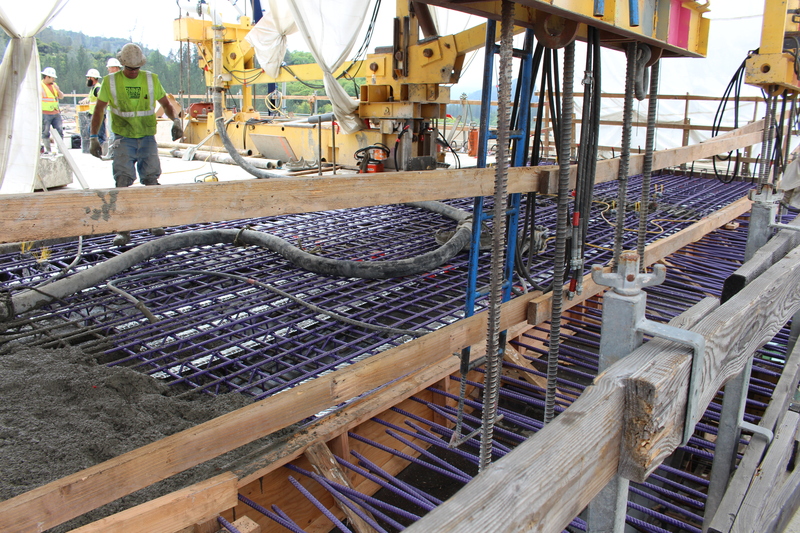 The project is located in a high seismic area and incorporates complex earthquake-resistant design details. 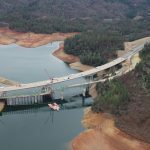 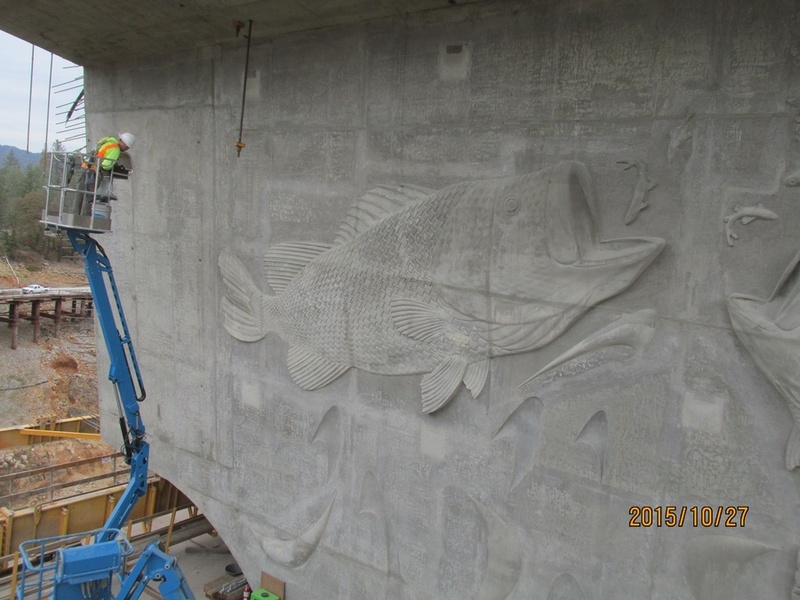 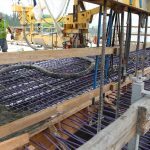 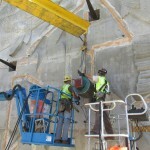 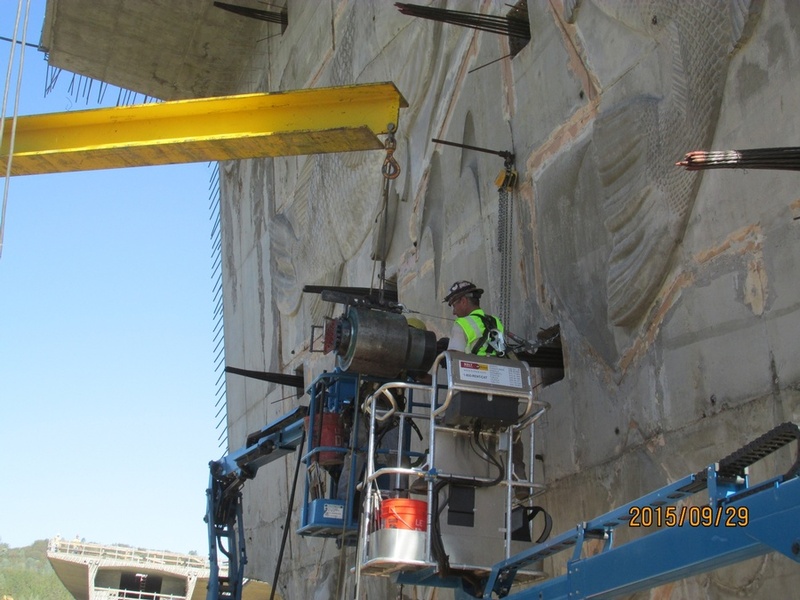 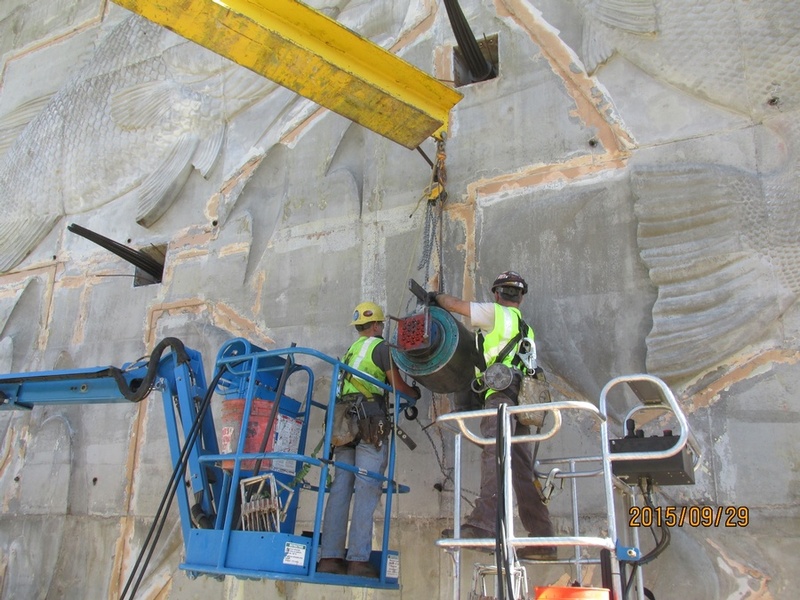 Additionally, project challenges included seasonal water level fluctuations of approximately 50’-70’ and difficult access – piers that extend over 120’ above the water and 100’ to the bottom of the lake. 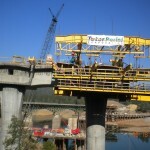 To overcome these obstacles, a waterline trestle was constructed at each pier allowing the use of cranes. 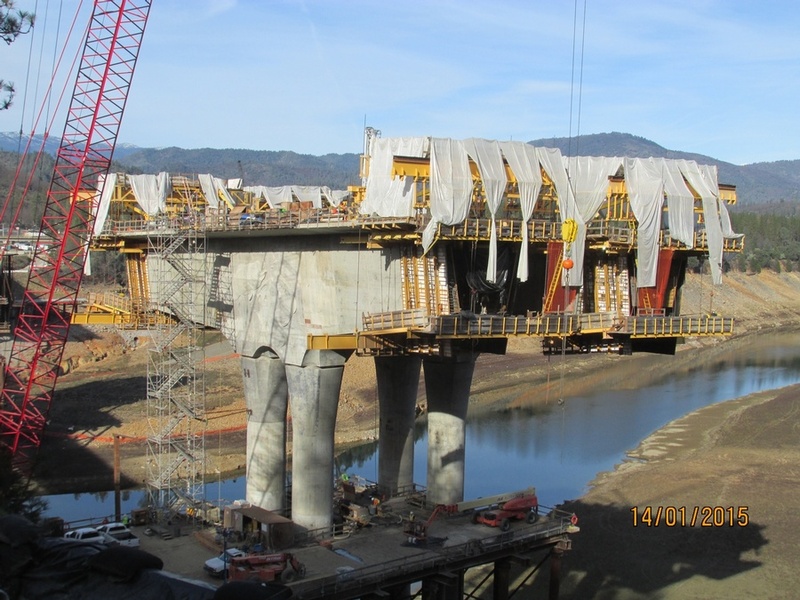 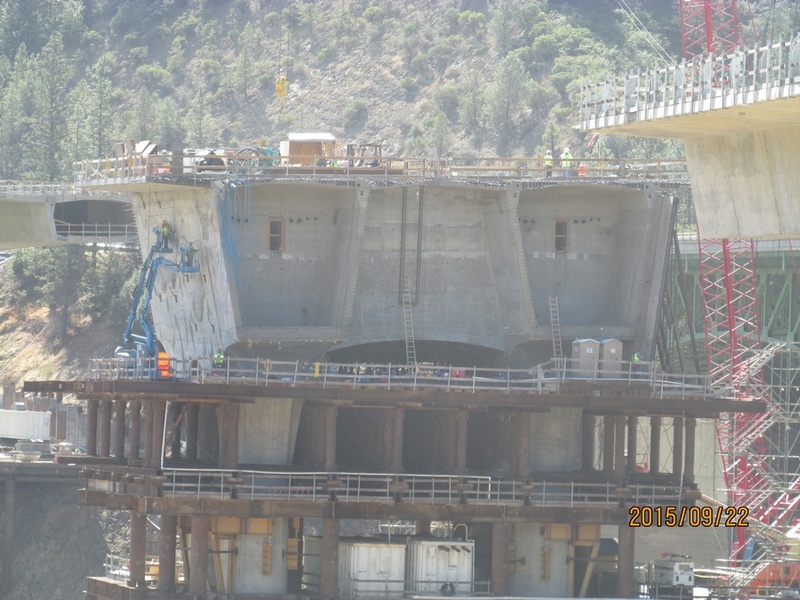 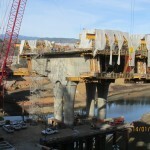 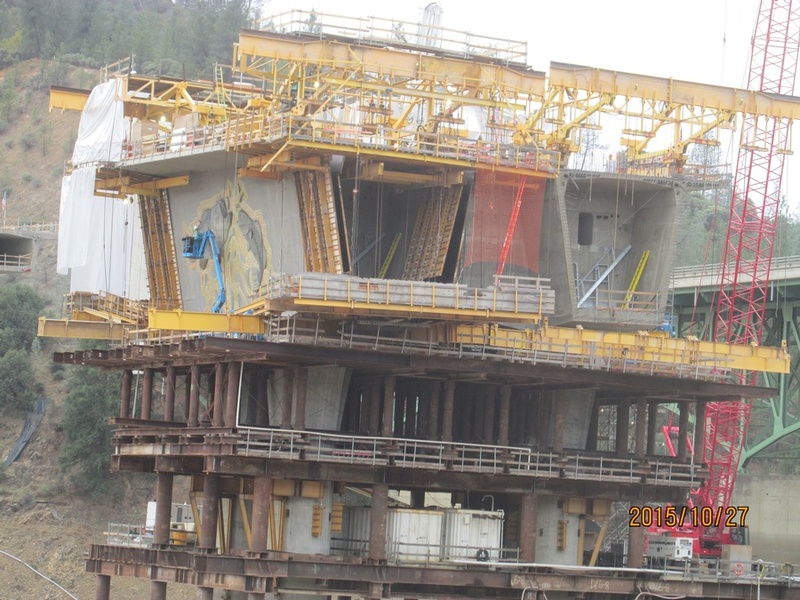 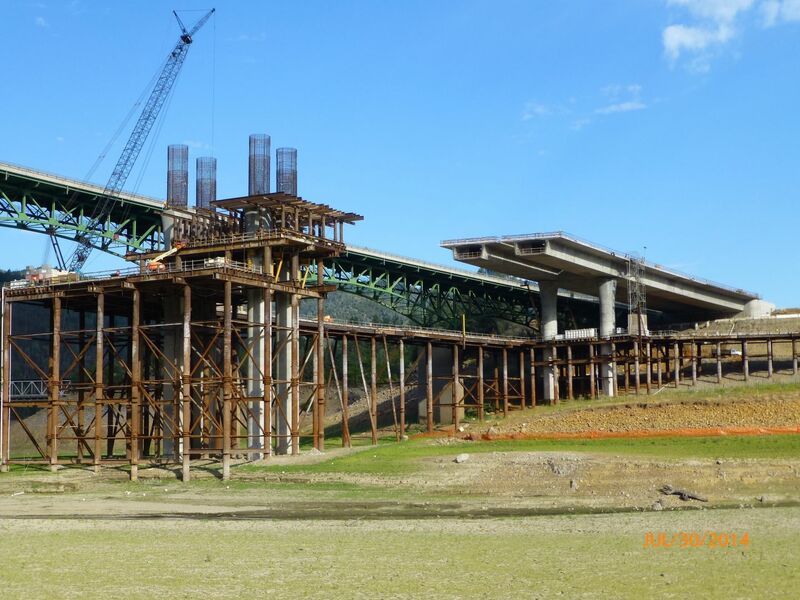 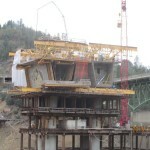 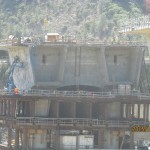 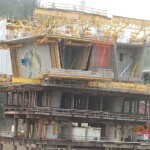 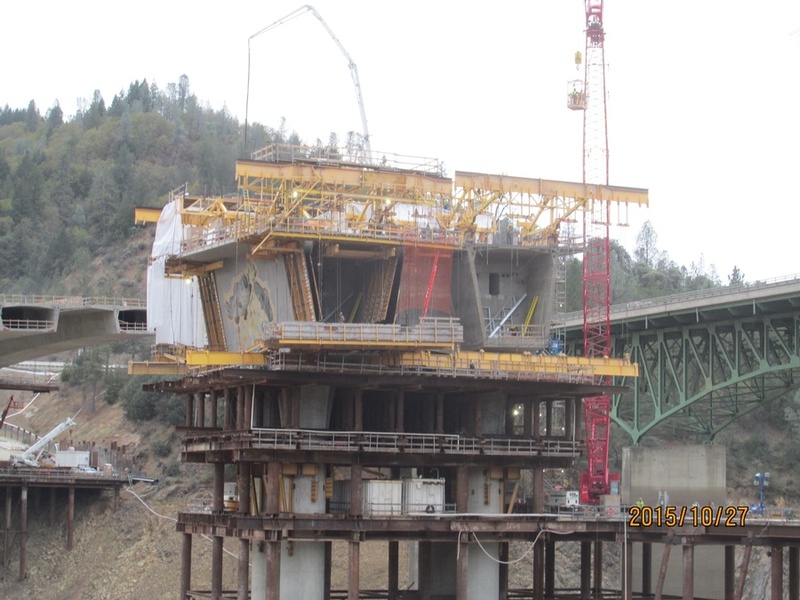 The falsework system design supported by the piers facilitated the construction of the 550 cubic yard pier tables. 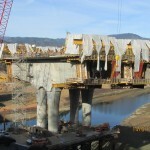 The remaining segments were cast using two pairs of form travelers in balanced cantilever. 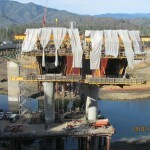 FINLEY provided segmental bridge design and construction engineering (3D time dependent longitudinal superstructure analysis) including camber analysis, geometry control manuals, post-tensioning calculations, temporary support falsework structures, construction manual, integrated segment shop drawings and design office support during construction.